What is Hep C Discussion Point™? Hep C Discussion Point™ is a tool designed by medical experts that takes you through a series of questions about your hepatitis C experience. Once you’ve completed the questions, the program generates a customized list of topics you can print out and use as a guide in talking with your doctor about your hepatitis C health care. Words highlighted in Yellow can be clicked to see their definition. Once you’ve completed the questions, a Hep C Discussion Point™ printout will be generated. The printout can be downloaded to your computer to save and print. If you close your session without completing the questions and return later, you will have to start the questionnaire over again and re-enter your information to generate a printout. This is done to protect your privacy. You are welcome to come back and use the tool as often as you would like. Your privacy is very important to us, and the Caring Ambassadors Program is committed to protecting your privacy. 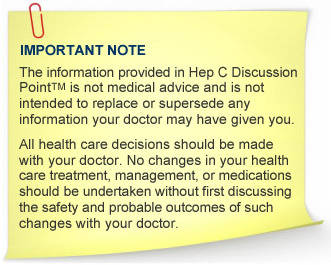 The information you provide while using Hep C Discussion Point™ is not stored. It is held in the server only while your session is active. Once your Hep C Discussion Point™ printout is generated and your session is closed, your information is no longer held. The course of hepatitis C is different for every person. Regardless of your treatment choices, the Caring Ambassadors Hepatitis C Program urges all people living with hepatitis C to be followed regularly by a licensed health care professional. Click here to enter Hep C Discussion Point™. The definition of a term can be seen here. Name your file and note the folder where you save it to. You can reopen the report later by double clicking on it. Hepatitis C Antibody Screening Test (also called anti-HCV antibody test) – a test for antibodies produced by the immune system in response to the hepatitis C virus; the presence of anti-HCV antibodies indicate exposure to the hepatitis C virus but does not indicate whether the virus is currently present in the body; if the screening test is positive, another test (called a PCR or viral load test) is done to determine if a person is currently infected with the hepatitis C virus. Hepatitis A – a disease caused by the hepatitis A virus (HAV); transmitted by food or drink that has been contaminated by an infected person; symptoms include nausea, fever, and jaundice (yellowing of the skin and/or eyes); a vaccine can be given to protect against hepatitis A infection. Hepatitis B – a disease caused by the hepatitis B virus (HBV); transmitted sexually or by contact with infected blood; hepatitis B may progress to chronic hepatitis; a vaccine can be given to protect against hepatitis B infection. Environmental Toxins - substances in a person’s home, work, or living area that can cause damage to the human body; examples of these substances include benzene, carbon monoxide, carbon tetrachloride and other dry cleaning fluids, chlorine, dioxin, exhaust fumes, fluoride and fluorine, organophosphorous pesticides, paints, petroleum-based chemicals such as gasoline and diesel fuel, radioactive substances, and solvents. Body Mass Index (also called BMI) – a measure of whether a person’s body weight is proportional to his/her height; a measure of health body weight. BMI is calculated from your weight and height. Your BMI will be included in your report final results. Activity Level – Your activity level can include things other than traditional exercise. Anything that keeps your heart rate up over a period of time contributes to activity level. If you are active or exercise with an accelerate heart rate for at least 30 minutes 5 days per week, answer "Active." If your activity level is less than this, answer "Inactive." Anxiety - a medical condition marked by intense apprehension or fear of real or imagined danger. Depression – a mental condition characterized by apathy, lack of emotional expression, social withdrawal, changes in eating and sleep patterns, and fatigue; a mental condition that can accompany any life-changing event including being diagnosed with a chronic illness; a possible side effect of interferon/ribavirin therapy. Respond "yes" if you drink any form of alcohol including beer, wine, wine coolers, and/or hard liquor. Answer "no" only if you never drink any beer, wine, or other alcoholic beverages. Tobacco Products – includes cigarettes, cigars, pipe tobacco, and chewing tobacco. Answer "no" only if you never smoke marijuana. Answer "yes" if you currently smoke marijuana, even if only occasionally. Street drugs include any substance that is not prescribed to you by a medical professional and is taken for recreational purposes such as cocaine, crack, methamphetamine, heroin, and unprescribed pain medications. HCV genotype, PT-INR, CBC with differential, TSH, urinalysis, iron, TIBC, ferritin, electrolytes, glucose (fasting blood sugar), BUN, creatinine, total protein, albumin, AST, ALT, Alk Phos, GGT, bilirubin, uric acid, cholesterol and triglycerides. Interferon-Based Therapy – any therapy that uses interferon as the main component; interferon-based therapy is currently the standard treatment of chronic hepatitis C in western (allopathic) medicine; trade names for interferon include Roferon-A®, Intron-A®, Rebetron®, Peg-Intron®, Pegasys®, and Infergen®. Responder – a person whose level of hepatitis C virus becomes undetectable on interferon-based treatment. Non-Responder– a person whose virus level does not drop to undetectable levels while on interferon-based treatment. Relapse – the reappearance of the hepatitis C virus after it previously being undetectable in response to interferon-based treatment. Cirrhosis – scarring of the liver that has progressed to the point that the structure of the liver is abnormal; the stage of liver disease that follows if there is progressive fibrosis. Ascites – abnormal accumulation of fluid in the abdomen; a common complication of portal hypertension. Esophageal Varix (pl. varices) – an abnormally dilated or swollen vein; portal hypertension can cause esophageal varices that can rupture and cause vomiting of large amounts of blood. Portal Hypertension – increased blood pressure in the portal vein that brings blood into the liver; the increased pressure in the portal vein also causes increased pressure in the veins of the abdomen, intestines, stomach, and esophagus; portal hypertension causes many of the complications associated with liver cirrhosis. Hepatic Encephalopathy – a complication of liver failure that results from large amounts of ammonia that accumulate in the brain; symptoms include euphoria, depression, confusion, slurred speech, abnormal sleeping patterns, incoherent speech, tremors, rigid muscles, and eventually coma. Hepatorenal Syndrome - the development of kidney failure in patients with advanced chronic liver disease. Liver Failure – a state in which the liver is unable to adequately perform its many functions; usually the result of end-stage cirrhosis; characterized by clotting abnormalities, protein abnormalities, abnormal electrolytes, and many other signs and symptoms. A liver transplant evaluation is an extensive series of tests typically over a 2- to 3-day period. It involves visits with a transplant surgeon, a transplant hepatologist, transplant nurse coordinator, a psychiatrist, a social worker, a dietitian, a financial coordinator and other consultants as appropriate. The evaluation is to help you and your doctors decide whether a liver transplant is the best choice for you. Liver Biopsy – the removal and subsequent microscopic examination of small samples of liver tissue; performed by inserting a long needle through the skin into the liver to take the samples. Fibrosis – in liver disease, scar tissue in the liver. Stage – the degree of fibrosis present on liver biopsy; the higher the stage, the more fibrosis present. Genotype – one of several different species of the hepatitis C virus; different genotypes have some differences in the genes they contain. Viral Load – the amount of hepatitis virus present in the blood. Interferon - trade names for interferon include Roferon-A®, Intron-A®, Rebetron®, Peg-Intron®, Pegasys®, and Infergen®. Contraindication – in medicine, a condition or other reason not to use a particular drug or treatment. © Caring Ambassadors Program, Inc.